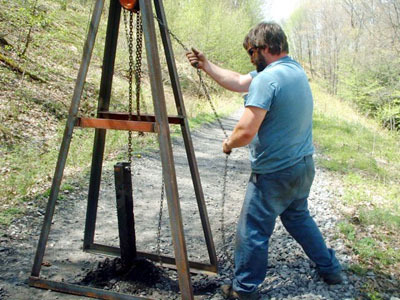 George Leigey removing the metal posts in the center of the trail. George Leigey has been a member of SSRTA for 4 years. He is a Safety Committee Chairperson. George and his wife Diane live in Rebersburg, PA. They like to spend time with their four daughters and grandson. George works for Beavertown Block Company Inc. in Pleasant Gap and has been able to have them donate construction materials and a raffle prize for a recent fundraiser. Diane is the Manager for the Texaco Pleasant Gap Food Mart. They enjoy riding their ATVs on the trail. They have been at most of the work details. George’s input and hard work have made the safety construction projects go smoother (old tie removal skid plates, panel placement, and fastening to railings). George has been the driving force behind the most recent work detail. His thoughts and enthusiasm on the removal of the rails that stick up from the trail surface will make travel on the trail safer for everyone. Most of the rails have been removed from the Viaduct to the Gillentown trailhead.